1. WHY INCREASE WATER PRICE? The increase will fund the higher costs of desalination and Newater production, as well as that of maintaining Singapore's current water infrastructure. Demand is expected to double by 2060, and every additional drop of water will have to come from more expensive water sources. In addition, the cost of water transmission has increased as Singapore lays deeper pipes in an urbanised environment. 2. WHAT IS THE INCREASE? The hike will be carried out in two phases: in July 1 this year, and July 1 next year. The total increase, including taxes, will be about 30 per cent. 3. WHAT ARE THE WATER FEES AND TAXES? The sanitary appliance fee and the waterborne fee goes towards the cost of treating used water, and maintaining the used water network. They will be combined into a single fee from July 1 and the restructured fee will be based on water usage. By July 1, 2018, the fee will be $0.92 per cubic metre for households with water consumption of 40 cubic metres or less. A higher rate of $1.18 per cubic metre will be imposed on those who use more than 40 cubic metres. The increase will be introduced in two phases (see table below). The Water Conservation Tax reinforces the message that water is precious. This will be raised to between 50 and 65 per cent of the tariff by 2018. 4. WHAT IS THE IMPLICATION FOR HOME USERS? The changes will add up to an increase of less than $18 for three quarters of households. After rebates, 75 per cent of HDB households will see this lowered to less than $12. The increase is estimated to be less than $25 per month for three-quarters of businesses. The tariff will increase to $1.19 per cubic metre in July and then to $1.21 per cubic metre next year. 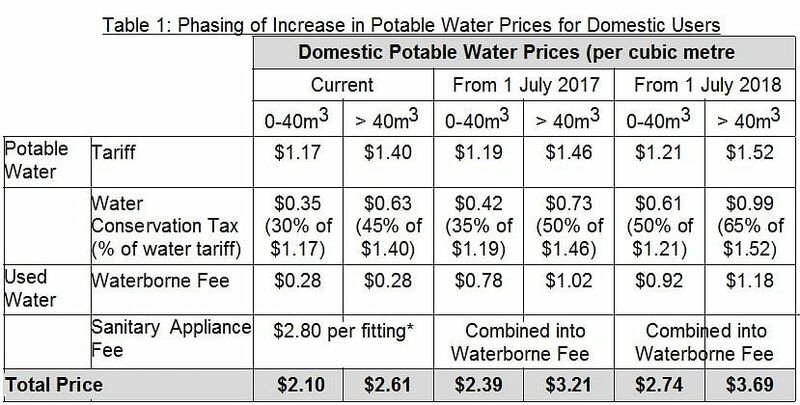 The waterborne fee will increase to $0.92 by 2018. The Water Conservation Tax will increase to 50 per cent and businesses using Newater will also start paying a tax of 10 per cent. The price for industrial water will rise from $0.65 per cubic metre to $0.66 per cubic metre from July 1. 6. WHAT ARE THE REBATES? The increases will be offset by a permanent increase in U-Save rebates for HDB households. One- and two-room HDB households will see no increase in their water bills while an average four-room flat household may see an increase of $5 a month after rebates, national water agency PUB said. Those living in executive flats will get $40 a year more, while those living in three-room flats will receive $100 in additional U-Save rebates. 7. HOW MUCH WATER DOES SINGAPORE USE? Singapore now uses 430 million gallons of water a day, with the domestic sector accounting for 45 per cent, and the non-domestic sector, the rest. Water demand is expected to more than double by 2060. The four National Taps are imported water, water from local catchment areas, desalination and Newater. More than half our current water consumption relies on imported and local catchment water,which rely on weather conditions. Newater is projected to meet 55 per cent of water needs and desalination up to 30 per cent by 2060. [By 2060, water usage will more than double, so say 900 mgd? Desalination will provide 30% of water so, 270 mgd. NEWater will provide 55% so 495 mgd? Total from these two will be 765 mgd.